Mihr-un-nissa Begum (born c. 1605) also known as Ladli Begum was the daughter of Empress Nur Jahan, and her first husband Sher Afgan of the Mughal Empire. She was the wife of Prince Shahryar Mirza son of Emperor Jahangir. Mihr-un-nissa Begum was the daughter of Ali Quli Beg, who held the title Sher Afgan Khan. Her mother was Mehr-un-nissa Khanum, daughter of Mirza Ghiyas Beg also known as Itimad-ud-daula. She was also the first cousin of Emperor Shah Jahan's wife Empress Mumtaz Mahal, daughter of Asaf Khan. After Sher Afgan's death in 1607, she and her mother were summoned to Agra by Jahangir to act as ladies-in-waiting to his step-mother, Empress Ruqaiya Sultan Begum, chief wife of the late Emperor Akbar. In 1611, her mother remarried Emperor Jahangir, and became known as Empress Nur Jahan Begum. In 1617, Nur Jahan and her brother Asaf Khan, planned to marry Mihr-un-nissa to Prince Khusrau Mirza, Jahangir's eldest son, and to re-create him the heir apparent, in place of Prince Khurram Mirza (future Emperor Shah Jahan). However, Khusrau declined their offer, because he loved his wife, the daughter of Mirza Aziz Koka, who had stuck him through the long years of imprisonment and blindness. When Mihr-un-nissa was about sixteen, Jahangir asked her hand in marriage for his son Shahryar. On 22 December 1620, he sent one lakh rupees in cash and goods as a sachaq to Mirza Ghiyas Beg's quarters, which were accompanied by most of the great Amirs. A large celebration of utmost elaboratness was held at Ghiyas Beg's quarters. Jahangir accompanied by the ladies of the imperial harem also went to his quarters. The marriage took place on 23 April 1621 and was performed at Ghiyas Beg's house. Here again Jahangir accompanied by the ladies of the imperial harem participated in the celebrations. After eight gharis had elapsed of Thursday night, the wedding took place under favorable auspices. Muhammad Sharif Mutamid Khan, who observed the events first hand, believed that Nur Jahan's manoeuvrings were jeopardising the security of the state. On 13 September 1623, Mihr-un-nissa gave birth to the couple's only child, a daughter, named Arzani Begum. Jahangir died on 28 October 1627, and her husband Shahryar ascended the throne at Lahore,  as her mother Nur Jahan had desired. Shah Jahan ascended the throne on 19 January 1628, and on 23 January, he ordered the execution of Shahryar, Prince Daniyal Mirza's sons Tahmuras Mirza and Hoshang Mirza, and Prince Khusrau Mirza's sons Dawar Bakhsh Mirza, and Garshasp Mirza. Mihr-un-nissa, now a young widow of twenty two, settled with her mother at Lahore. The two of them lived a simple and austere life. 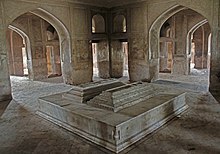 Nur Jahan died in 1645, and was buried beside her husband, Jahangir, in a separate mausoleum, which she had build from the funds she received from Emperor Shah Jahan. After her death, Mihr-un-nissa was also buried beside her mother. ^ Pelsaert, Francisco (January 1, 1979). De Geschriften van Francisco Pelsaert over Mughal Indië, 1627:Kroniek en Remonstrantie. Nijhoff. p. 134. ISBN 978-9-024-72173-3. ^ Sharma, S. R. (January 1, 1999). Mughal Empire in India: A Systematic Study Including Source Material, Volume 2. Atlantoc Publishers & Dist. p. 341. ISBN 978-8-171-56818-5. ^ Eraly, Abraham (2000). Emperors of the Peacock Throne: The Saga of the Great Mughals. Penguin Books India. p. 268. ISBN 978-0-141-00143-2. ^ Shujauddin, Mohammad; Shujauddin, Razia (1967). The Life and Times of Noor Jahan. Caravan Book House. p. 25. ^ Mukherjee, Soma (2001). Royal Mughal Ladies and Their Contributions. Gyan Books. p. 135. ISBN 978-8-121-20760-7. ^ Nicoll 2009, p. 104. ^ a b Nicoll 2009, p. 118. ^ Jahangir & Thackston 1999, p. 353. ^ Jahangir & Thackston 1999, p. 361. ^ Nicoll 2009, p. 119. ^ Jahangir & Thackston 1999, p. 406. ^ Abū al-Faz̤l ibn Mubārak (1873). The Ain i Akbari - Volume 1. Rouse. p. 311. ^ Jahangir & Thackston 1999, p. 457. ^ Jahangir & Thackston 1999, p. 460. ^ Mehta, JI (1986). Advanced Study in the History of Medieval India. Sterling Publishers Pvt. Ltd. p. 417. ISBN 978-8-120-71015-3. ^ Nicoll 2009, p. 293. Nicoll, Fergus (2009). Shah Jahan: The Rise and Fall of the Mughal Emperor. Penguin Books India. ISBN 978-0-670-08303-9. Jahangir, Emperor; Thackston, Wheeler McIntosh (1999). The Jahangirnama : memoirs of Jahangir, Emperor of India. Washington, D. C.: Freer Gallery of Art, Arthur M. Sackler Gallery, Smithsonian Institution; New York: Oxford University Press. This page was last edited on 18 June 2018, at 09:50 (UTC).